It is now the final sprint until Christmas. There are only two auction weekends before Melbourne Cup weekend and 6-8 weeks until Christmas. With some vendors wary of auctioning so close to the Cup (5th November) and the weekend immediately before Christmas (17th December) – that leaves six. This is only the second run of multiple auction weekends for the year and may prove to be the best opportunity for buyers still searching, to buy before 2017. 69a Munro Avenue, Ashburton (Daniel Wheeler, Marshall White) – sold comfortably above $1.9million after the pair at 69 sold for $1.8million only 10 months ago. 1 Stevens Parade, Black Rock (Campbell Cooney, Hodges) – which could have been considered ‘land only’ by some given the solid, yet basic, home on site. This pocket of Black Rock is starting to get some traction as the land west of Bluff Road falls out of reach for many buyers now – 637sqm and $1.53million or $2,401sqm (if you place no value on the home). 8 Stanhope Grove Camberwell (Peter and William Chen, Jellis Craig) sold after auction just under $3million. Busy location yet the house over a single level with good garaging and a pretty period façade was certainly going to attract interest, particularly at this level in this market. This last sold back in 2011 for $2.4m. How has the market responded since then? Auctioneer Richard Earle looked for an opening bid and got one after a bit of time at $2.7m. With no further interest from bidders, two vendor bids at $2.75 then $2.8m were placed. Bidder two entered the fray and ultimately had the property passed in to them at $2.95m and bought it shortly after for an undisclosed price not far off this. With a rise of about $600K (or 25%) in five years, this indicates that the market is solid right now, but buyers are not prepared to go crazy for B-graders. Such properties are at least selling……..if the vendors are realistic. 37 Wrights Terrace Prahran (Mark Robertson/Carla Fetter, Jellis Craig) sold strongly under the hammer, $1.731m. 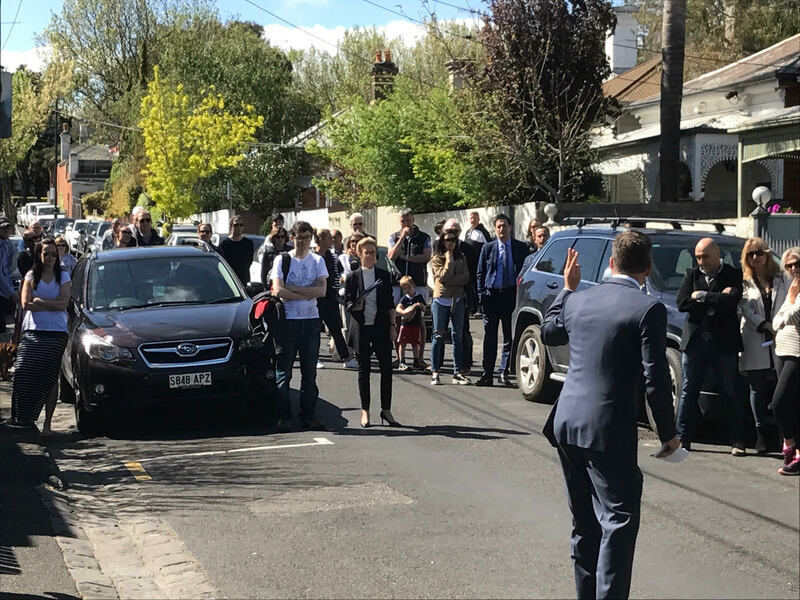 A solid crowd of 40 people gathered for this auction and there was definitely a good vibe – this auction was going to go well. Why? It was a good offering. Double-fronted brick homes with north facing rear orientations and off-street parking are exceptions rather than than norms in this street, and the position is a convenient one. 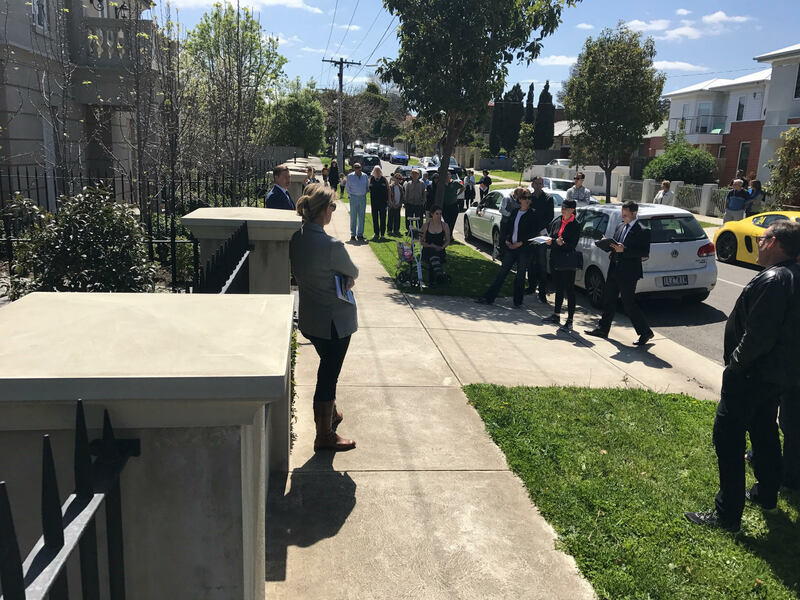 A lowball opening bid of $1.25million saw Mark Robertson swing into action quite quickly, conducting traffic from a further 6 bidders in all. 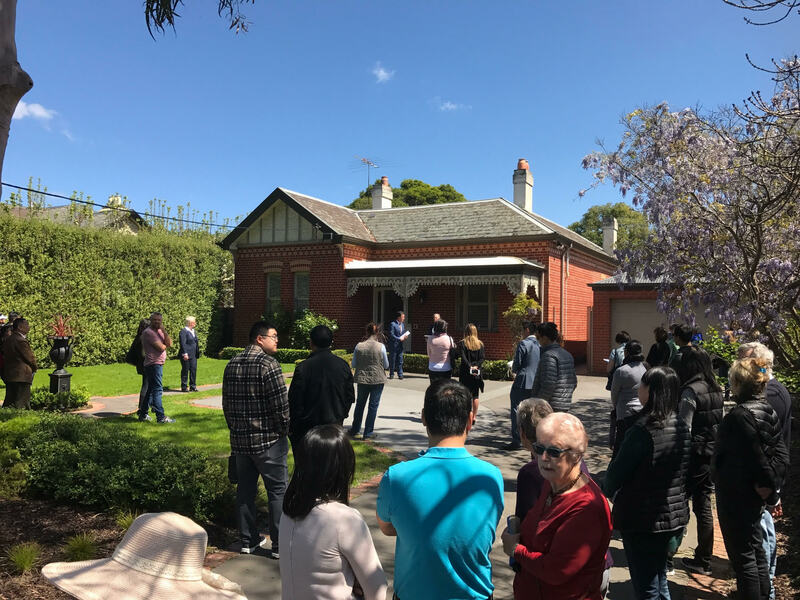 The property was announced on the market at $1.45m and sold strongly for $1.731m – both vendor and and buyer would be very happy here.